A former Met Police officer has been summonsed to appear in court to face a charge of indecently assaulting a boy under 16 while he was in police custody, Scotland Yard has said. Gurpal Virdi, 55, of Hounslow, west London, is alleged to have assaulted the boy at the Old Bailey between 30 September and 31 December in 1986. 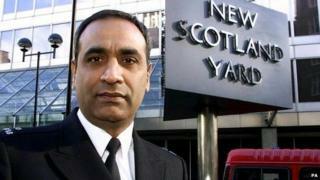 Mr Virdi, a detective sergeant, retired after 30 years with the Met in 2012. He will appear before Westminster Magistrates' Court on 30 May. He was interviewed under caution in March, a Met spokesman said.